ORTELIUS, A. / COIGNET, M. - Portugallia. 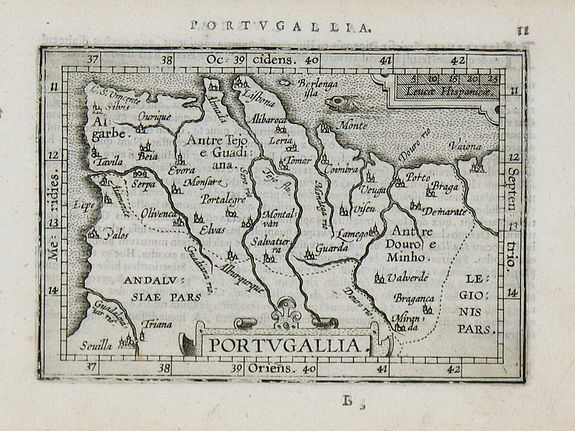 Portugallia. - ORTELIUS, A. / COIGNET, M.
Map maker : ORTELIUS, A. / COIGNET, M.. Size : 3.1 x 4.7 inches. / 8.0 x 12.0 cm. Description :Miniature map of a part of Spain and Portugal, with major cities named. Strapwork title cartouche. Latin text on verso. Condition : Nice and dark printing, in mint condition.